Previously on Eternal Central we featured a free Puzzling challenge titled Doomsday: The Puzzling – The Double Deathrite Conundrum. The solution to this Puzzling can be found below. 2) Tap Island to cast Brainstorm into Mental Note and Misdirection, putting back Underground Sea and X. Cast Mental Note, binning Underground Sea and X, drawing Laboratory Maniac. 3) Sacrifice Polluted Delta to fetch the remaining Underground Sea (going to 5 life). 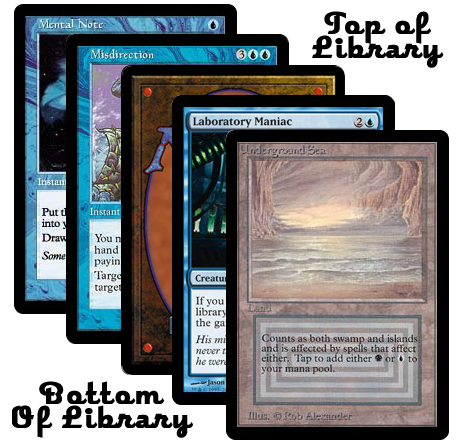 Tap Underground Sea to cast Laboratory Maniac. 4) Tap Sensei’s Divining Top to win the game. If your opponent tries to Abrupt Decay the Laboratory Maniac in response, Misdirect the Decay (pitching Gitaxian Probe). The Underground Sea and Gitaxian Probe in hand were red herrings. The Gitaxian Probe is an efficient and useful way to trigger Maniac or draw Mental Note, but it is unnecessary here. It’s main purpose is to serve as pitch fodder for Misdirection. It was included to have people explore solutions in which Probe is used to dig into the Doomsday pile or trigger Maniac, and was a red herring. Similarly, Underground Sea was here as a life-free way to generate mana, and to get you to think it was therefore a useful line of play. Both cards were here to expand the lines of play to make your analysis more difficult, illustrating the real-life complexity that additional lines of play bring to the Doomsday pilot. Be on the lookout for a new Puzzling scenario coming soon titled Doomsday: The Puzzling – The Dream Halls Dilemma. For more mind-bending Doomsday Puzzles, be sure to check out So Many Insane Plays – Doomsday: The Puzzling – Five Puzzles to Blow Your Mind! There are 5 levels of increasing difficulty, and this puzzle above builds on those examples and lessons. Have fun!